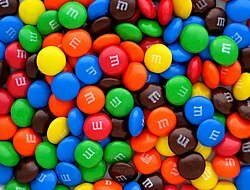 M&Ms, chocolate with a shell of coloured sugar. Confectionery or sweets is a type of food that has a lot of sugar in it and is very sweet. It often includes things that are rich in artificial sweeteners, flavours and colourings. The words candy (North America), sweets (UK and Ireland) and lollies (Australia and New Zealand) are also used for the many kinds of confections. Confections are usually low in nutrients but rich in calories. Sweets can come from anywhere. This page was last changed on 13 June 2018, at 10:54.